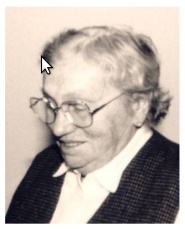 Martha Wüstemann was born on 17th June 1908. Brought up in Leipzig she joined the Anarcho-Syndicalist Youth (SAJD). There she met and married Arthur Lewin (see his biography here at libcom). From February 1929 they worked with Gees and Paul Helberg at a printshop of the anarcho-syndicalist union FAUD. In 1932, Martha and Arthur officially divorced in order to take pressure off of their family as Arthur was Jewish. Arthur went to Spain in 1933 and Martha and their daughter followed him there a year later. In Spain Martha and Arthur participated in the activities of the German Anarcho-Syndicalists (DAS). With the coming of the Spanish revolution in July 1936 the DAS, in close alliance with the CNT, engaged in detecting and rooting out the strong Nazi network that had been set up in Spain. Martha helped take over and collectivise a German bookstore in Barcelona. The bookshop workers were in the socialist union the UGT, but Martha as a CNT member tried to implement the ideas pf the CNT there. She established links with the libertarian women’s organisation Mujeres Libres (Free Women). After the May Days in Spain, German exile anarchists were targeted by the Stalinists. Martha was arrested at the bookstore and her daughter sent with a letter and a bus ticket to friends. Meanwhile everything in her flat was confiscated. She was incarcerated in the Stalinist prison of Puerto del Angel. Ironically the prison was guarded by a CNT militia man who stood outside, rifle in hands, thinking he was guarding fascists. When the Stalinist Chekists began to fear that the Federacion Anarquista Iberica was planning on busting out the prisoners, they decided to move them. The women prisoners made a huge commotion when they realised this, and as the prison was on a main street . their captors were forced to transfer them to an official womens’ prison. Again ironically, this prison was run by a member of the POUM. Emma Goldman, then in Spain, had campaigned to get the release of Katja Landau, the wife of the Austrian Kurt Landau, who had been recently murdered by the Stalinists. Katja Landau then advertised the presence of Martha in custody. She was released but the Chekists kept hold of her travel documents and from then on she had to live illegally in Spain. Martha fled to the border with Spain. Because she had no documents, she was refused entry to France, but caused such a commotion that the authorities allowed her to cross the border and she was put in charge of the International Commission of Refugees. From 1938 Martha lived in Paris. There she made contact with the Paris group of the DAS but which because of the defeat in Spain and personal quarrels led a shadowy existence. She contacted a tailoring collective of Bulgarian anarchist exiles in Paris and worked with them . During the Nazi occupation of Paris she escaped with her daughter to a remote children’s home outside the capital and survived there during the war. After the war she moved to Munich. She spoke on the Spanish Revolution at a memorial meeting put on by Munich anarchists in 1986. She died on the 28th September 1992. Illfeld, Egon aka Ginez Garcia, 1914-198? Ta for putting up the photo of Martha.